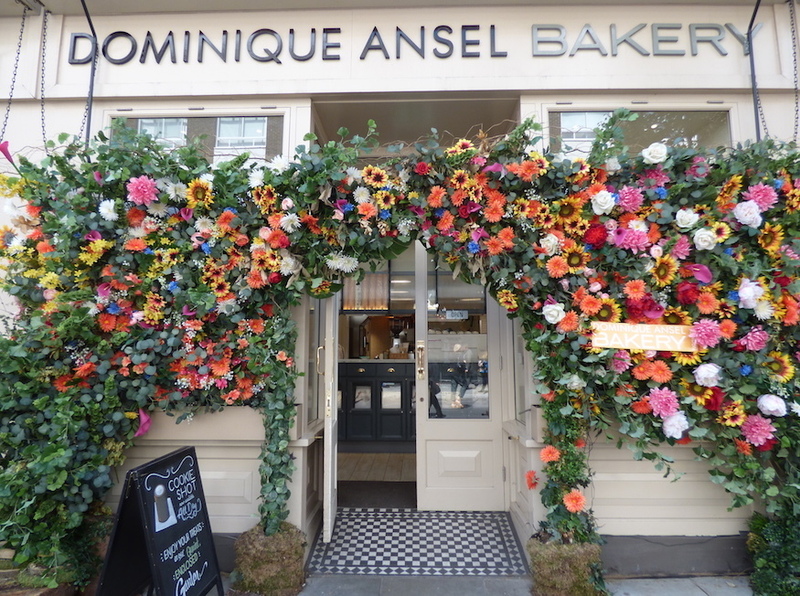 An afternoon tea at Dominique Ansel Bakery — inventor of the Cronut — was never going to be a run-of-the-mill affair. 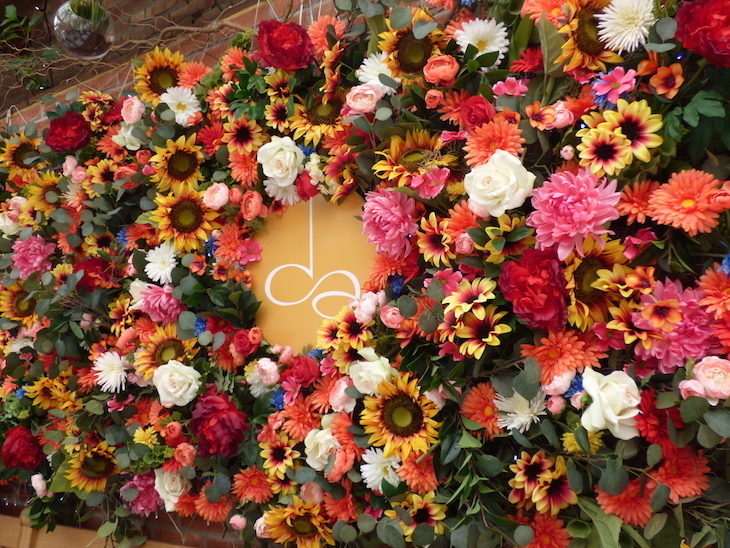 The psychedelic arch of flowers which welcomes us into the door of the Belgravia premises is just the beginning of an afternoon of complete floral immersion. But hay fever sufferers needn't fear — there's not a real rose or genuine gerbera in sight. We're led to the covered garden terrace. It's a light and airy space but to be honest, we barely pay any attention to most of the room, our eyes fixating on that colourful wall of (fake) flowers. It's the stuff Instagram dreams are made of. 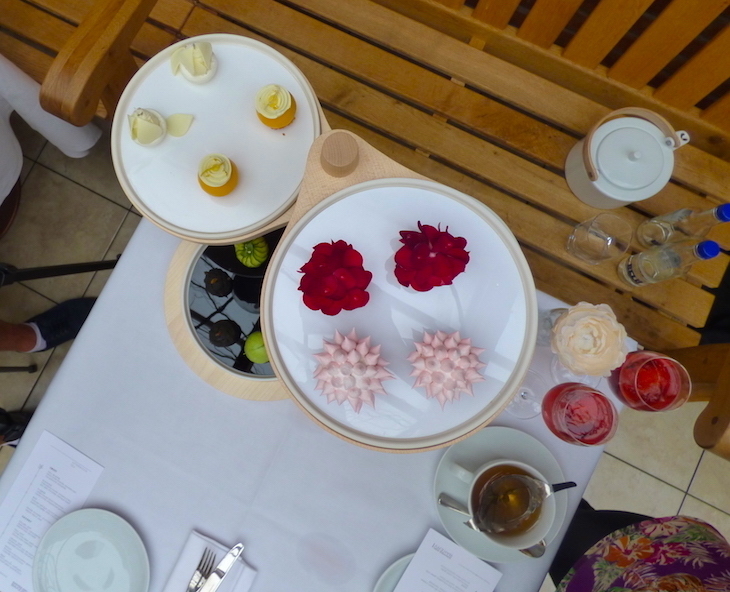 The tea too has a floral theme; each offering represents one stage of the life cycle of a flower, from seed to full bloom, via five savoury and five sweet courses. That sounds poncy, and individually it's not all that obvious, but lining the ten bitesized courses up, all becomes clear. From seed (bottom left) to blossom (top), the layers represent the life cycle of a flower. In contrast to our eye-catching surroundings, the appearance of the food is somewhat muted, but don't be fooled. Fancy flavours burst out in every biteful — and yet they're not always the flavours you'd expect; a surprise feta filling here, a mysterious mousse there. The 'flower' stage of the life cycle is represented by a vanilla mousse, lemon marmalade, cookie crumble and basil ganache concoction. Yes, you read that right, basil. It's a bit of an odd one, with more than a mild overtone of pesto, leading our companion to comment "I feel like I'm eating a... greenhouse". It's a bold move, and yet, it's not bad. Not bad at all. 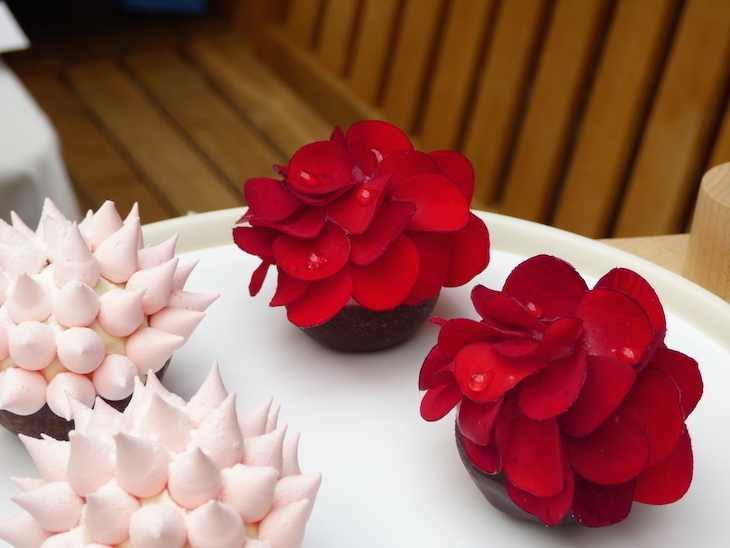 An afternoon tea that gets us thinking is a new experience. 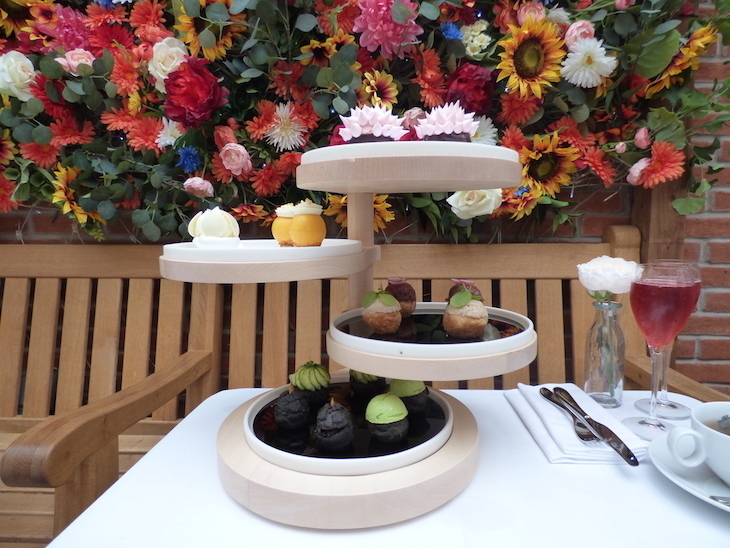 Once we've eaten our way through the savoury course, our scones are brought to our table. 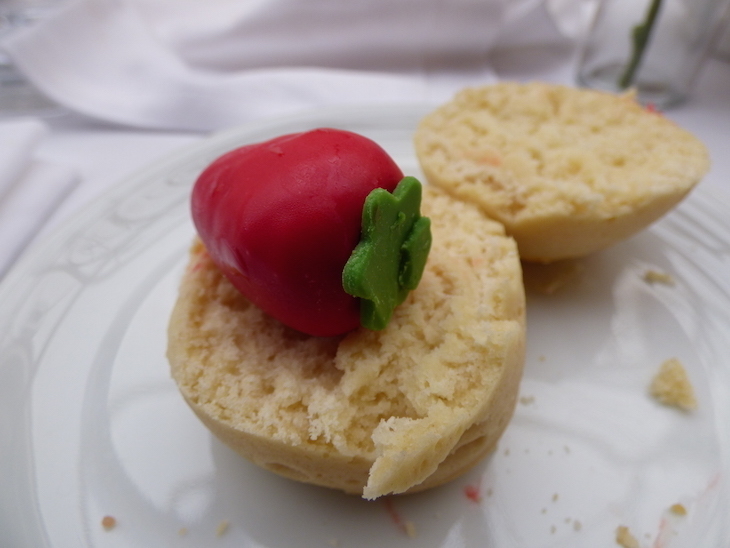 They're a staple of afternoon tea, but even these have the wow factor — they're served with what look like marzipan strawberries, but turn out to be parcels of jam and cream, coated in white chocolate. Simply place the strawberry on the scone and get spreading. At the very least, it cuts out the jam-or-cream-first conundrum. It's just another example of the innovative, bold thinking that's gone into this experience. Rather than playing it safe with your average sandwiches and cakes, Dominique Ansel has put together some combinations that shouldn't work on paper, but come together beautifully in the flesh. There's one way this afternoon tea lets itself down, and that's the lack of vegetarian option. All five of the savoury offerings contain meat or fish of some sort, including smoked salmon and steak tartare, rendering them unsuitable for veggies. Considering how common vegetarianism and veganism are in London these days, this is surprising — and ironic, given the meal's heavy focus on plants. For carnivores though, this is a fancy yet fulfilling afternoon tea, with plenty of Instagram likes thrown in. 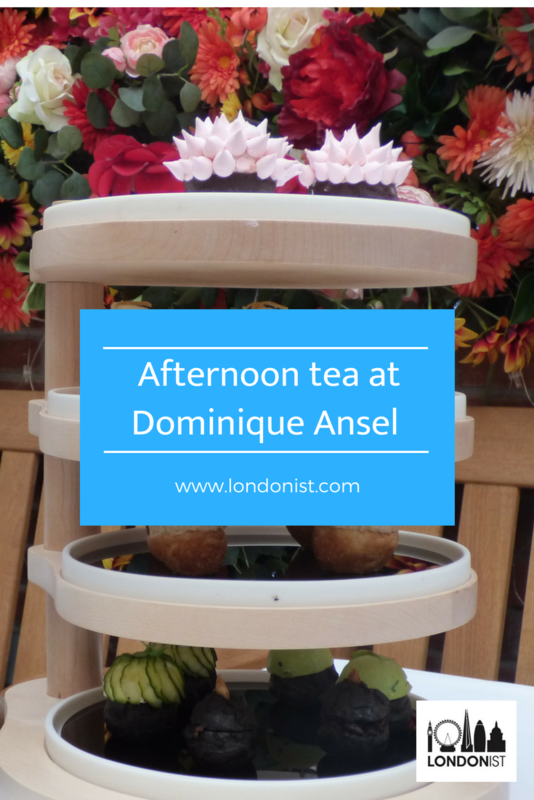 Afternoon tea at Dominique Ansel London, 17-21 Elizabeth Street, Belgravia, SW1W 9RP. 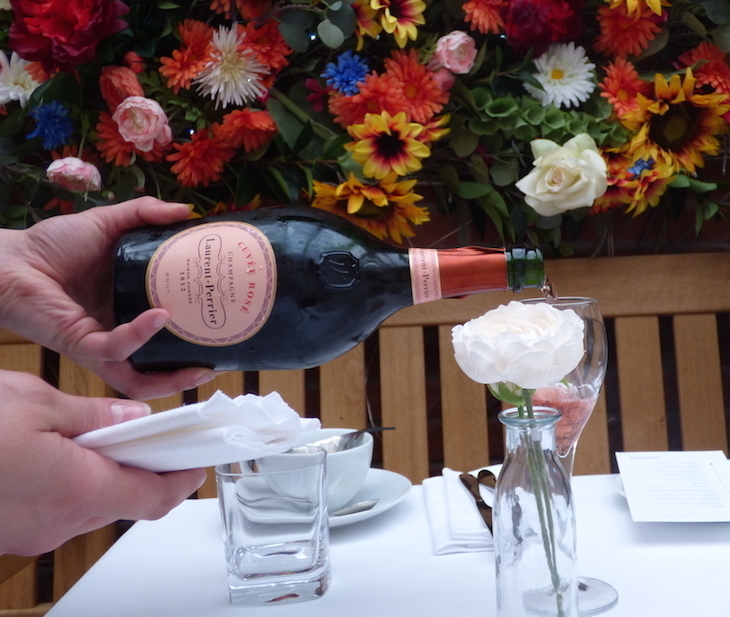 From £42 per person, booking required.